Let’s face it: I don’t think ammo prices will ever be dirt cheap like they used to be. While prices still have come down, everyone is always looking for a bargain. When it comes to ammo these days, brands like Wolf and TulAmmo have the cheap market covered. However, many indoor range shooters will find that these brands are commonly not allowed due to their steel cores that can spark and create fires. Also, with trade/importation embargoes against Russia, there is a scare that this cheap ammo may go away. TulAmmo has an answer. I was in Walmart the other day looking to pick up some ammo when I saw something called “BrassMaxx”. I saw that it was made my TulAmmo, so I thought maybe there was a brass case with the same old steel core bullet. I did a quick search online before buying it and discovered these rounds failed the magnet test. I decided to buy the little white jar. I got it for about $22. The jar contains 100 115 grain rounds and says made in Bosnia and Herzegovina on it. So when I got home, I checked first with a magnet and found that they are indeed indoor range approved. 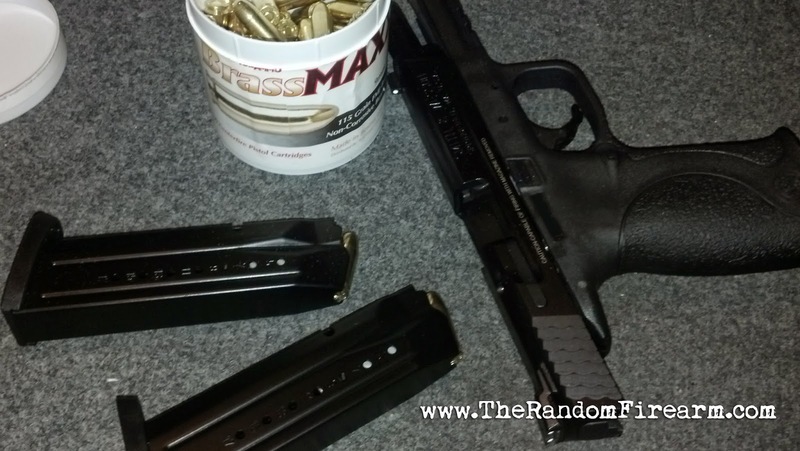 A couple days later, I headed off to the range with my Smith and Wesson M&P 9 and my SCCY CPX-2 to test these rounds out. When I got to the range, they didn’t even do the magnet test; they just looked and said it was fine. I first started off with my M&P 9. The grouping was nothing spectacular (keep in mind that I am not the best shooter). It was interesting to note that the slide did not lock back on the last round, multiple times with each magazine. I didn’t expect that, but continued anyway. The SCCY also fed them well, however, the same issue in that the slide did not lock back after the last round with both magazines occurred. 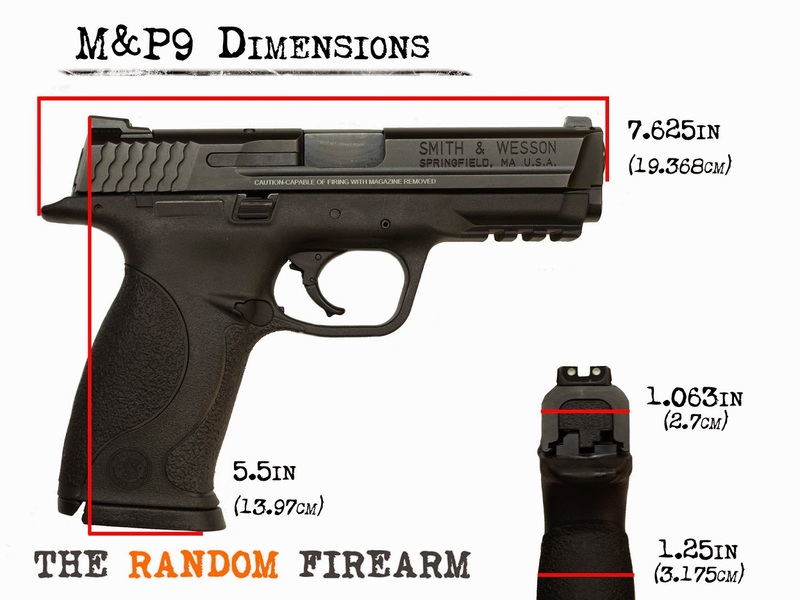 Both the SCCY and the M&P 9 had this issue with about every other magazine. The SCCY also experienced one failure to feed. Each round did fire and landed where I was aiming. I am very dumbfounded by the slides not locking back every now and then. I don’t know if I can attribute that to the BrassMaxx. Perhaps they don’t have enough power to get the slide all the way back? If that’s the case, why did I not get any other malfunctions except the one failure to feed? 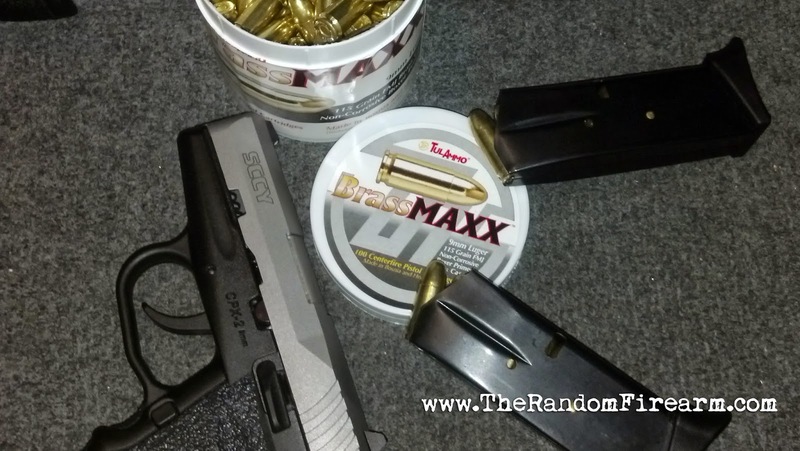 All in all, if you are looking for something cheap to play with at your indoor ranges, I would recommend BrassMaxx. With this slide issue, I would not recommend these rounds for anything serious. Normally I would not contribute that to an ammunition issue, but since it happened on two very different firearms, it leaves me thinking that it was. Have you used this ammunition? What do you think about it? Let me know in the comments below! Thanks for reading! So I was watching Ian on Forgotten Weapons talk about a Cobray Terminator shotgun that was going to be featured in the upcoming Rock Island Action. I decided to take a look at the link in the description of the video to learn more about the “interesting” shotgun. 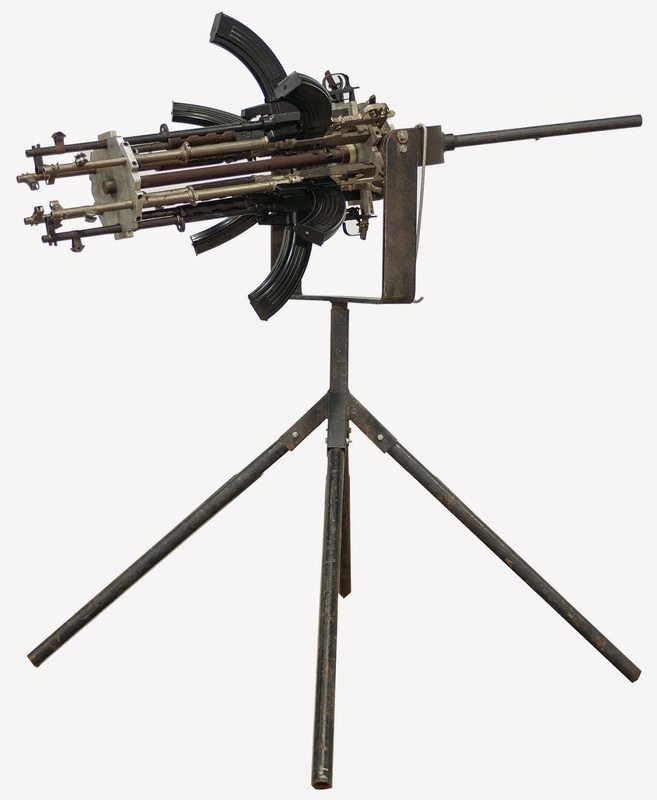 As I was browsing the other auction lots, I came across what appears to be an SKS Gatling Gun. Obviously this was created more as a novelty then as something practical. It seems as if all the triggers are connected to something, so I guess it does actually function. According to Rock Island, I guess all the SKS rifles are Norinco. This would definitely be something that would scare kids off your lawn. As a matter of fact, I think it was left out on someone’s lawn as the rifles, stand, and other parts seem very rusty. Some of the rifles appear to be nickel. I doubt they are parade/honor guard models. They were probably spray painted by the same person who came up with this. The listing does say that some do have a nickel finish, but I still have my doubts. Each rifle does appear to have its own thirty round magazine, so with six rifles, that’s 180 rounds to throw down range. Well, to throw somewhere, because I am not sure how accurate something like this would be. Poking around on the internet, I did see two more like this. It wasn’t the same one because one had all blued rifles, and the other had some camouflage paint scheme. However, they did all seem to be made the same way, so I wonder if one person ended up making a few of these for whatever customers wanted them. If you are interested in owning this, well it’s at an auction, so it certainly can be yours. Now, do you buy it as one rifle, or do you have to pay six separate transfer fees? If you end up winning the bid, please let me know! The estimated price is $800 - $1200. Check it out on Rock Island Auction. If you have read this blog before, you know that I like carrying full sized handguns: my 1911 specifically. Recently, Tread Softly Concealment, based in Florida, sent me a holster my Smith and Wesson M&P for me to try out. It was an inside the waistband holster, similar to the Galco that I use for my 1911. However, this holster is a bit different. How? It’s simply better. First off, when I got my holster from Tread Softy Concealment, the first thing I did was notice the leather seemed a little thin. After a month of wearing it, I realized that it is still top notch quality, and it’s actually quite beneficial if you have a thicker firearm. The back of the leather is a little rough, and that caused some friction on my hip, but after about a week it broke in, and it didn’t bother me again. The other thing that surprised me was the quality of the metal clips. They are not as wide as other brands, but they have much more rigidity then others. They make a satisfying “snap” when you push the holster onto your belt. I would find these difficult to bend, even with getting it caught on something. I have done that with other holsters, and the clips bent, and it’s not easy, or really possible to get them back in place. Not only does the holster stay on your hip, but your firearm stays in your holster. The retention on this is amazing. If you watch the video at the bottom of this blog, you can see that I am running, jumping, climbing, and the firearm doesn’t move one bit. However, and swift pull, and your firearm is ready for action. This is in part due to the expertly molded Kydex, and of course the pressure from your own body. 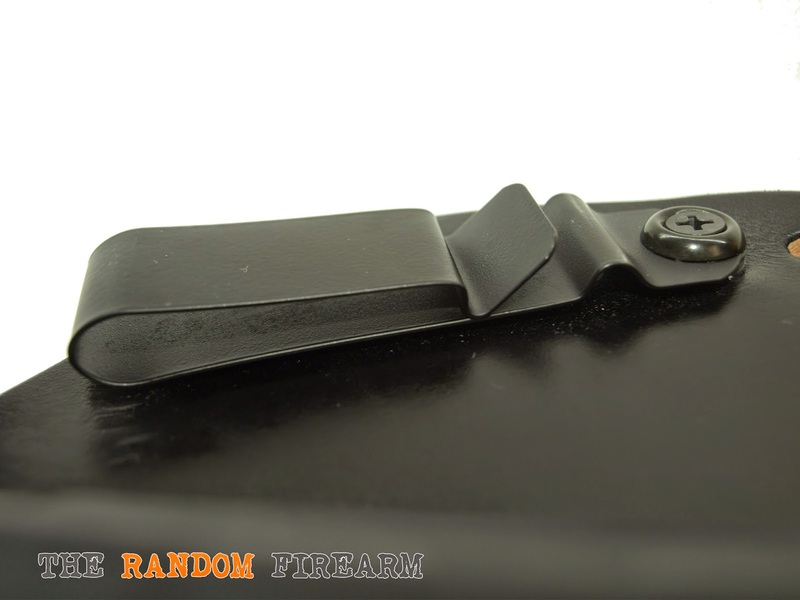 The cant of the Kydex is perfect for concealing a full sized firearm, and with it being riveted in place, you know that is going to stay there, and you will have a predictable draw each and every time. Even with carrying this full sized firearm, this holster is quite comfortable. The only time I had any discomfort was when I was wearing my suit which has tailored pants. Of course it would be tight: I’m adding an extra inch plus. That comes with the territory of wearing this style of holster. Even sitting in your car is comfortable with this holster. So I have said pretty much nothing but good things about this holster. Why? Because it is really that good. Many holsters like this go for around $100, but this one is only $40! I’m cheap when it comes to anything, so even this is something I can afford! If you don’t have an M&P, Tread Softly Concealment makes many different holsters for many different firearms. You can even custom make your own holster! 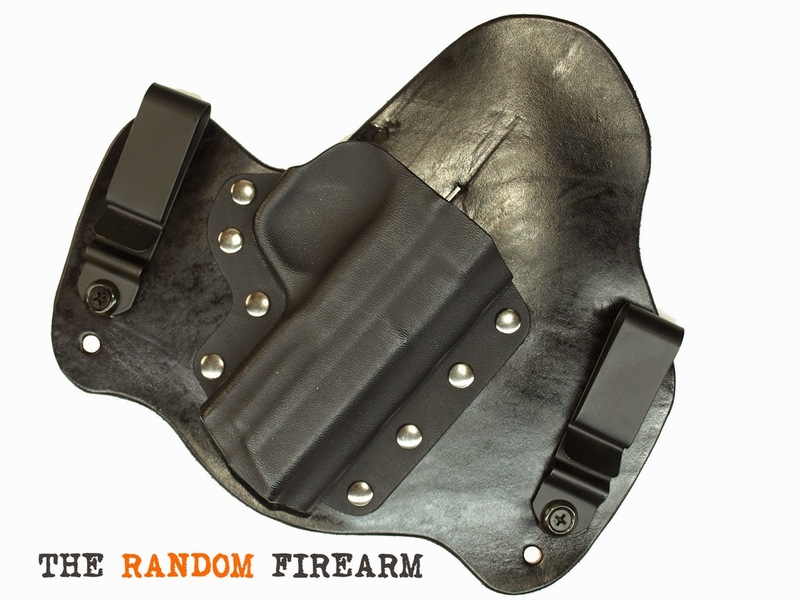 Get your Tread Softy Concealment holster here, and tell them The Random Firearm sent you! Thanks for stopping by, and don’t forget to check us on Facebook, Twitter, and YouTube!